This article complements "WindowMaker for PCLinuxOS: an Introduction". Here I give you the basics on how to use WindowMaker as a PCLinuxOS desktop. 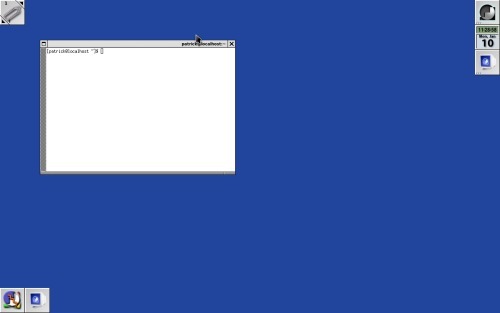 Shown here is a default WindowMaker desktop with xterm open. This desktop looks quite plain when compared with KDE, GNOME, Enlightenment, XFCE, or LXDE. However, the WindowMaker desktop is very configurable, simply by launching WindowMaker Configuration Manager from the system menu. The utility can be found under More Applications -> Configuration. The 64x64 pixel icon with the GNUStep logo at the upper right hand corner of your screen is the Dock. What you see here is what you see when you first launch WindowMaker. In PCLinuxOS (and in Mandriva), there are two icons below the GNUStep icon. The dock has been configured to show the system date and time, and a launcher for a terminal window (xterm). This dock is expandable by dragging icons on the lower left hand corner of the screen to the bottom of the stack. There are two kinds of icons that can be dragged to the dock. The first kind is a created by a currently running application such as Firefox, OpenOffice.org, or the GIMP. The icon associated with the application appears at the lower left hand corner of the screen. The icon at the bottom of the dock is a launcher for a terminal emulator (xterm). In the screenshot below, I show you a way to move these icons to the dock. Since there is limited space on the dock, I recommend using this for applications you use often. Like GNOME, KDE, and other desktops available for PCLinuxOS, WindowMaker comes with four workspaces already configured. The icon on the upper left hand corner is what you use to switch between workspaces. The Clip is another example of a WindowMaker applet. Simply click on the arrows (at the upper right and lower left corners) to change workspaces. Also, icons docked to the Clip apply only to the current workspace where the icons are docked. Icons applied to the Dock apply to all workspaces. Right click anywhere in the background to pull up the System Menu. As configured in PCLinuxOS (and Mandriva), this menu is the same as the menus for all other desktops available in PCLinuxOS. This provides consistency between desktop environments if you have multiple desktops installed (e.g. WindowMaker installed along with GNOME, KDE, E17, XFCE, etc.). With this configuration, the menu changes as you install and remove applications from within Synaptic. Note: With some other distributions such as Slackware, openSuSE, Ubuntu and Fedora, there is a default menu setup by the developers of WindowMaker. You can configure WindowMaker to use this menu, but the menuing system here is not compatible with the menuing system configured with PCLinuxOS and Mandriva. This means that if you choose to use the WindowMaker default menu configuration instead of the PCLinuxOS default menu configuration, the menu you see will not change when you use Synaptic to add software, remove software, or update PCLinuxOS. If you use the WindowMaker default configuration, you will have to manually edit the menus using the Preferences utility or the WindowMaker Configuration Manager. To maintain the consistency we expect from PCLinuxOS, I do not recommend reconfiguring the menu in WindowMaker. You can also pull up the menu by pressing the F12 key on your keyboard. In addition to the System Menu, you can launch applications by double clicking on application icons that are docked in either the Dock or the Clip. Double clicking on the icon that looks like a 3D view of a monitor displaying the GNUstep logo opens a terminal window where you can launch applications from the command line. Of course, you will want to exit WindowMaker when you are finished with your session. This is accomplished by selecting Exit -> Exit from the System Menu. Selecting Exit -> Restart will restart WindowMaker with the current configuration. This is useful when you actually make changes to the WindowMaker configuration that require a restart to take effect. When you launch WindowMaker for the first time, a directory structure is created in your home directory. This is where you can install wallpapers, themes, icon sets, pixmaps for tiling. The directory structure is used by WindowMaker to store preferences on a per user basis. This directory structure starts with ~/GNUStep, and is the root directory for everything WindowMaker and AfterStep related. is where WindowMaker stores all preferences and user customizations. is where you install wallpapers, tiles, icons, etc. and is available only when you login to the desktop (i.e. on a per user basis). is for icons that are shared between WindowMaker and AfterStep. is where session defaults are stored and used throughout WindowMaker. 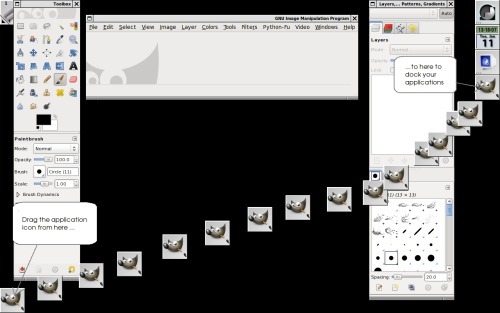 keeps track of where icons are on the desktop and the configuration of each icon, including the Dock and the Clip. keeps track of the location of application icons for each WindowMaker icon created. is where user customizations are stored. is where you install wallpapers for use with WindowMaker. is where WindowMaker stores application icons assigned to WindowMaker icons. is where you install icon collections for use with WindowMaker, icon sets are similar to icon themes for KDE. is where you install icons and other graphics to be used by WindowMaker. are where you install audio files for use with WindowMaker. This requires a separate WindowMaker sound server applet, which I shall explain later. is where customizations to the appearance of the menus are stored. This is similar in function to styles used by FluxBox and BlackBox. are where you store WindowMaker themes. Themes are stored as .tar.gz files. are other customizations to WindowMaker are stored on a per user basis.